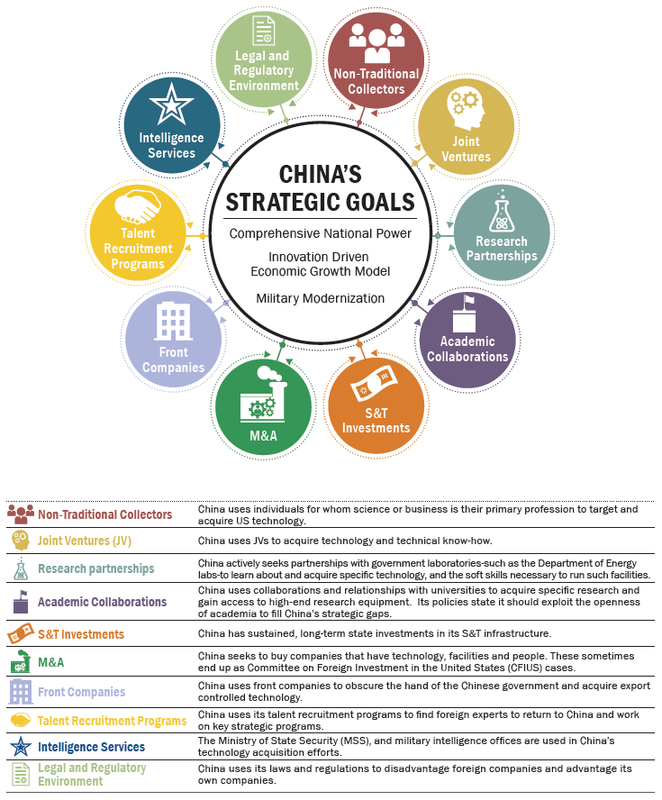 In the 2011 report to Congress on Foreign Spies Stealing U.S. Economic Secrets in Cyberspace, the Office of the National Counterintelligence Executive provided a baseline assessment of the many dangers facing the U.S. research, development, and manufacturing sectors when operating in cyberspace, the pervasive threats posed by foreign intelligence services and other threat actors, and the industries and technologies most likely at risk of espionage. The 2018 report provides additional insight into the most pervasive nation-state threats, and it includes a detailed breakout of the industrial sectors and technologies judged to be of highest interest to threat actors. It also discusses several potentially disruptive threat trends that warrant close attention. 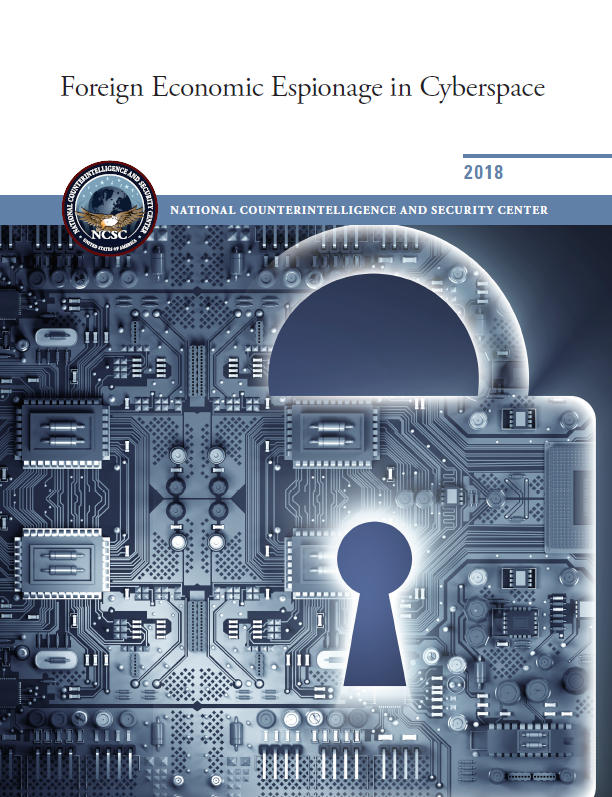 Foreign economic and industrial espionage against the United States continues to represent a significant threat to America’s prosperity, security, and competitive advantage. Cyberspace remains a preferred operational domain for a wide range of industrial espionage threat actors, from adversarial nation-states, to commercial enterprises operating under state influence, to sponsored activities conducted by proxy hacker groups. Next-generation technologies, such as Artificial Intelligence (AI) and the Internet-of-Things (IoT) will introduce new vulnerabilities to U.S. networks for which the cybersecurity community remains largely unprepared. Building an effective response will require understanding economic espionage as a worldwide, multi-vector threat to the integrity of the U.S. economy and global trade. Foreign intelligence services—and threat actors working on their behalf—continue to represent the most persistent and pervasive cyber intelligence threat. China, Russia, and Iran stand out as three of the most capable and active cyber actors tied to economic espionage and the potential theft of U.S. trade secrets and proprietary information. Countries with closer ties to the United States also have conducted cyber espionage to obtain U.S. technology. Despite advances in cybersecurity, cyber espionage continues to offer threat actors a relatively low-cost, high-yield avenue of approach to a wide spectrum of intellectual property. A range of potentially disruptive threat trends warrant attention. Software supply chain infiltration already threatens the critical infrastructure sector and is poised to threaten other sectors. Meanwhile, new foreign laws and increased risks posed by foreign technology companies due to their ties to host governments, may present U.S. companies with previously unforeseen threats. Cyber economic espionage is but one facet of the much larger, global economic espionage challenge. We look forward to engaging in the larger public discourse on mitigating the national economic harm caused by these threats.